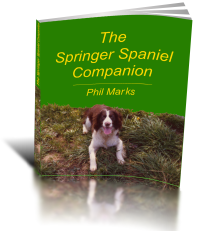 Paddy – a great video example of a springer spaniel sniffer dog working. He can sniff one billionth of a gram of explosive, and is used to protect the Royal Family and for public events security in Wales. Paddy , an Explosive detecting Springer Spaniel working at Public Events in Wales. Video. Bess an English Springer Spaniel retreives a 1LB canvas dummy from across the River Derwent. I’m a little cautious when asking her to do this as I have no way other than swimming to get across to the other side should she decide to mess about. Paul Coates.